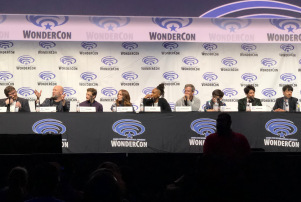 The Ready Player One promotion circuit hit Wondercon yesterday and a panel of Ernest Cline, screenwriter Zak Penn, Tye Sheridan, Olivia Cooke, Lena Waithe, Ben Mendelsohn, Philip Zhao, and Win Morisaki were in attendance to promote the Steven Spielberg movie. Ernest Cline revealed that Ready Player One was his favourite Steven Spielberg movie ever and Ready Player One would never have happened if it wasn't for the bearded director. An interesting story was told by screenwriter Zak Penn. He remembers when George Lucas showed up on set and gave Spielberg a hard time for shooting on digital. Zak said it was like watching two 10-year-old friends arguing. Also paying a visit to the set was Tom Cruise remembered by Olivia Cooke who embarrassingly recalls "that she blacked out, but that she was told that she bowed as though he were royalty."